October and especially November are the months, where you collect olives, fruits and berries, so you can boil, cook and preserve the next year’s stock, as you might know it from home. In Turkey, however, there is the advantage that there is the possibility of sun-drying items, tomatoes, figs and peppers (crushed to powder or flakes). One year I was in Turkey while all the peppers lay drying on the big balcony, which grandfather has to his house. I will NEVER forget the smell !! It was heavenly and more aromatic than anything I’ve ever scented before. It was nice to go hiking in the area, because all the houses dried something, so it scentet different everywhere. Yes, it could almost be a sport to guess what was drying on the terrace to every house we passed by. But I have unfortunately never been able to harvest olives for that simple reason, that I haven’t ever been there just that season. Usually always right before or after. And then it may also be that, that my dear father-in-law haven’t been that big olive farmer before. But this year was record year and I asked him to take pictures and send to me, which he did more than willingly. 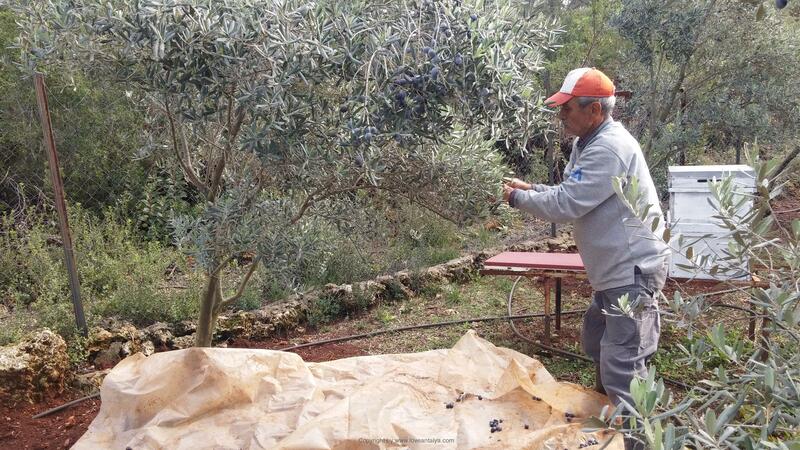 I’m thinking that harvesting olives in Turkey is like harvesting wine grapes in France. That is a bigger event and many people and hands are involved in harvesting, gathering, cutting, drying, treating and eventually squeezing. But I do think that it’s more hard work rather than a public party. And I have also found out, that it takes a lot if you want to be self-sufficient with both olive oil and pickled olives. And it might probably only few that are truly self-sufficient. 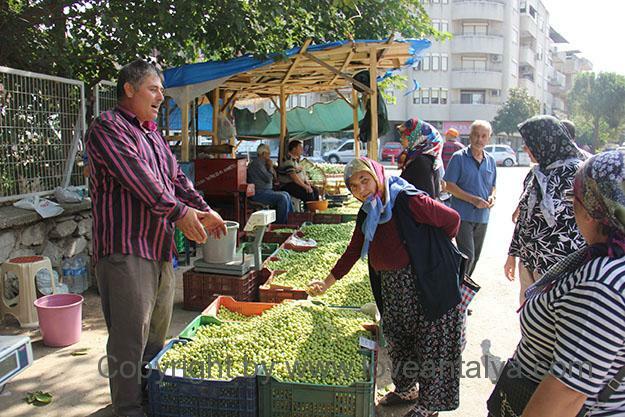 If you are in Turkey, the easiest is to go to the local bazaar and buy olives from some of the many dealers. Here are huge bags of black and green olives, large and small, with and without all sorts of spices added and much more than you can imagine. Yes, you can get it excactly like you want it. 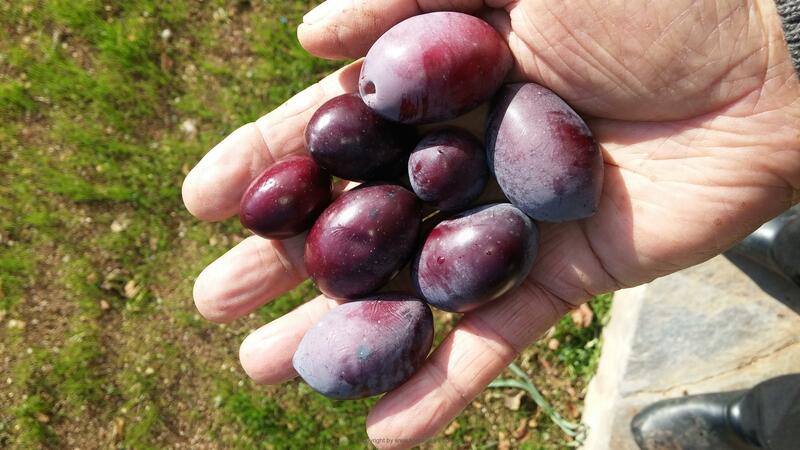 However, if you live in rural areas and have a few olive trees yourself, it’s not uncommon, to harvest and prepare your olives yourself, so you have enough for the whole year. Of course you can also just drop into the supermarket and buy olives from some of the many well-known brands. But it is not at all the same as those harvested and preserved by a real olive farmer (or a housewife). There is a whole different finesse behind. We always buy black Marmarabirlik olives from the local greengrocer, as they are clearly the best (if not grandfathers). My father-in-law AKA grandfather has not grown olive for such awful many years. Some of the trees have been there, while others have been planted recently as the interest has risen. In total, my father-in-law has approx. 22 trees – 4 old and 18 new. Of course, they require a little watering – for there is not much water in the dry summer months in Antalya. And then some fertilizer once a year before harvesting. So the trees doens’t crave much work. Last year my father in law received approx. 150 kg of olives and of course he was very proud of that. Last year it was only about 50 kg – so this year’s harvest was a success. Of them, about 120 kg went to the mill to get squessed, so he got about 20-25 liters of good fat olive oil. 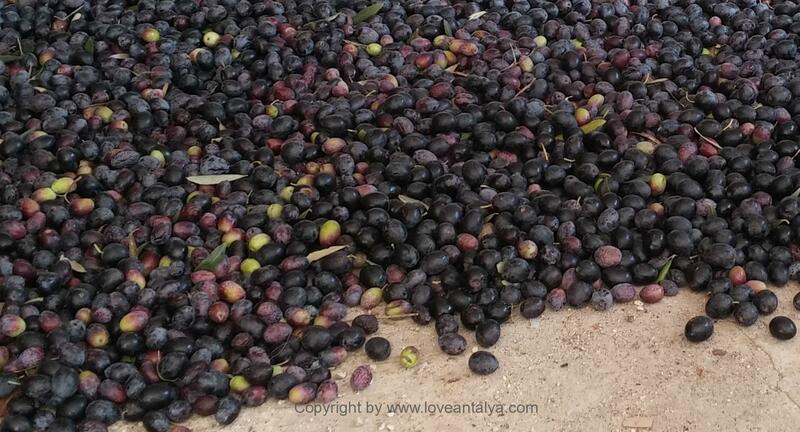 It takes about 4-5 kg ​​of olives per liter olive oil. 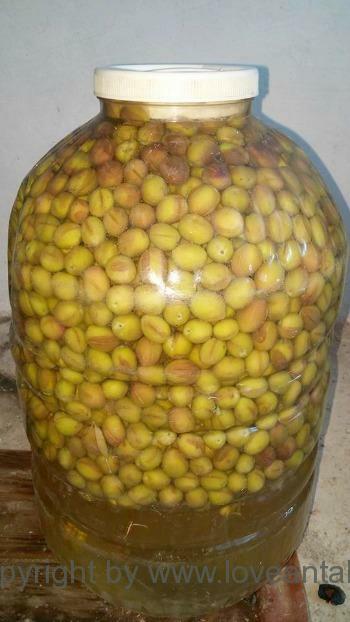 The remaining 30-35 kg are pickled. The olive mill (I would like to visit it once, because it must be very different from the Danish mills, I visited as a child) must have at least 250 kg of olives at a time, in order to press the oil. 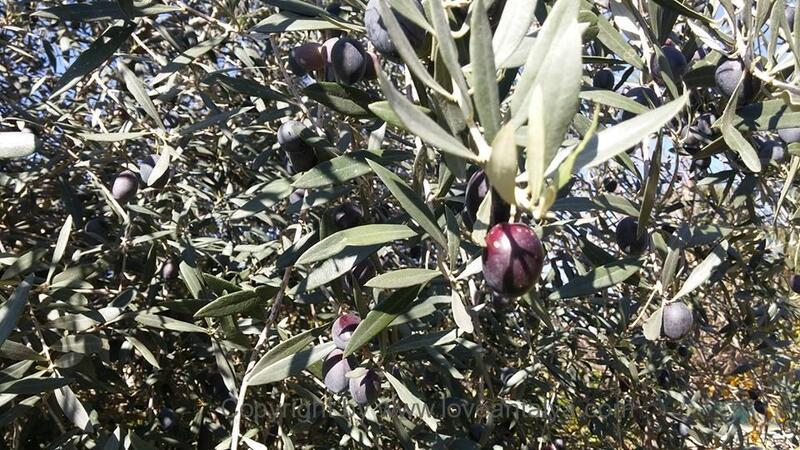 So father-in-law has merged with a neighbor, who has a pretty big olive grove with approx. 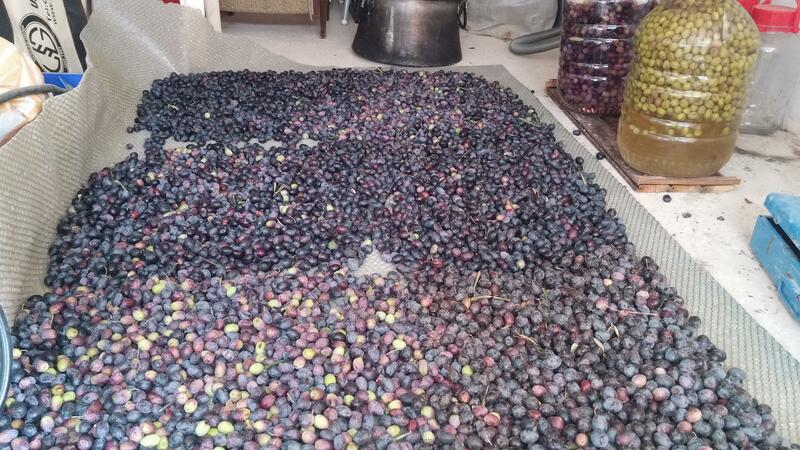 600 kg of olives annually. One can squeeze your olives in 2 ways. Either you can deliver your olives, so they are shredded by appointment and you get the exact oil back. Or you can deliver in a form of “common pool” and then bring the equivalent amount of oil home as the number of kilos of olives you have brought. How I would love to visit this mill and taste the freshly squeezed olive oil. I actually thought that there were different varieties, that had either green or black olives. But that’s obviously not. It is the same variety, where the green is harvested a bit before the black ones. In fact, olives can have many colors ranging from the very light green to almost pink, purple and eventually the black ones. Olive oil is always pressed by the black olives that are most mature and therefore have the highest oil content. They taste different depending on color and when harvested (and of course depending on variety and region). There are more than 100 different varieties of olive fruits, as we know them. In Turkey there are primarily 29 different varieties, that are used in their own way. 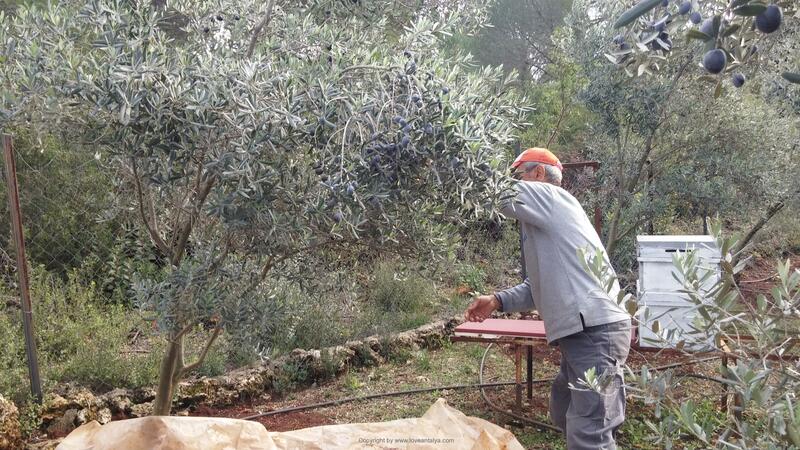 At grandfather you harvest the olives by placing a large tarpaulin under each tree, shaking the tree and picking the remaining olives by hand. What a job !! Fortunately, one of the nice neighbors always comes and helps. It is Mr. Savaş Bey you can see at the picture above. I was lucky to get the recipe for pickled olives from my father.in.law. Because his olives are simply the best. Especially the black ones. My husband gets candle in his eyes every time we are lucky to get a (cola) bottle filled with delicious pickled olives. He loves them, but they never last until the next supply arrives. Green olives – also called Cizik Zeytin – are cut 3 times on each olive and then placed in a container. Half fill the container with olives and then water to the edge. 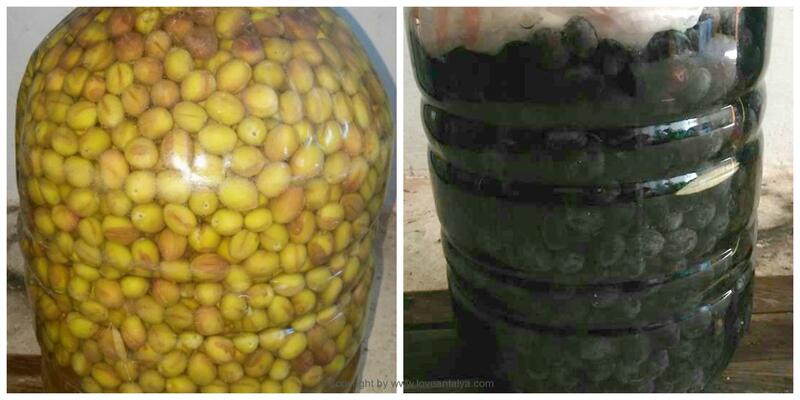 The water needs to be changed every day until the olive is no longer bitter – it takes about 8-10 days. The water is then changed a last time and add coarse salt (about ½ kg salt to 10 kg of olives). The pickled green olives can be eaten after about 3 weeks, when the meat easily drops from the stone. Yes, this was a small recipe if you happen to have a couple of kilos of fresh olives hanging on the trees in the garden. If you don’t, you can always buy some olives and then add the spices, herbs etc. you like. Then you have the touch of something homemade. You can see the article in Danish here / du kan se artiklen på dansk her.